Christmas 2016 came and went before I even had time to accept that it was that time of the year again. I had several weeks off work to spend time with my daughter Ciara, who, was already showing signs of school holiday fatigue after the first week, but we found ourselves being held hostage by the heat and humidity that I imagine many have been suffering from over the past few weeks. As a result, trips out in the Buick have been rather rare recently or should I say medium -rare, which was the condition of my left foot that I had absent-mindedly rested on the fire wall during one relatively short trip to The Entrance for an ice-cream last week. The combination of ambient atmospheric temperature, coupled with the furnace-like heat coming through the fire wall left my foot perfectly cooked and ready to eat! after the usual check of oil and other vital fluids, followed by a quick flick through the road map, I decided upon a trip up to Wollombi and lunch at the pub. Leaving Woongarrah, I drove west on Sparks Road passing over the M1 and eventually turned south onto Hue Hue Road and onward toward Wyong. At Alison Road I turned west on to Yarramalong Road, heading out toward the village of Yarramalong which lies at the end sharp end of the funnel shaped valley of the same name. One of the good things about living on the Central Coast is that you can be shopping at Westfields Tuggerah and within a ten-minute drive find yourself in verdant farm land with only the occasional farmer driving by. It should be noted that there are quite a few alternate backroad options on the Coast that can help you to sail passed M1 holiday traffic snarls. Yarramalong Road is single-laned, curving gently through the valley with turf farms making up the majority of the businesses in the area. Most of the road is either lined with evergreen trees forming an almost formal corridor or an overhanging canopy. The village itself is made up of several cafe/ restaurants, a vintage style homewares shop (closed down since my trip) and a service station for that last minute refuel before tackling Bumble Hill for the steep climb to Kulnura via Greta and then Spring Roads eventually turning north onto George Downes Drive and then took another turn northward onto the Great Northern Road just south of the town of Bucketty. riders coming up from Sydney via Wiseman’s Ferry or the Peats Ridge Road from the M1. 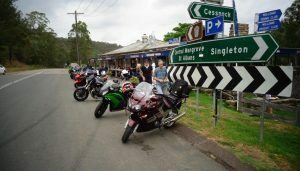 There are several morning tea stops available on the route with Jerry’s Gourmet Kitchen and Cafe located just north of Kulnura which was overwhelmed by lines of parked motorcycles. At various points on the side of the road I noted a number of convict constructed bridges and culverts that provided points of interest along the way. 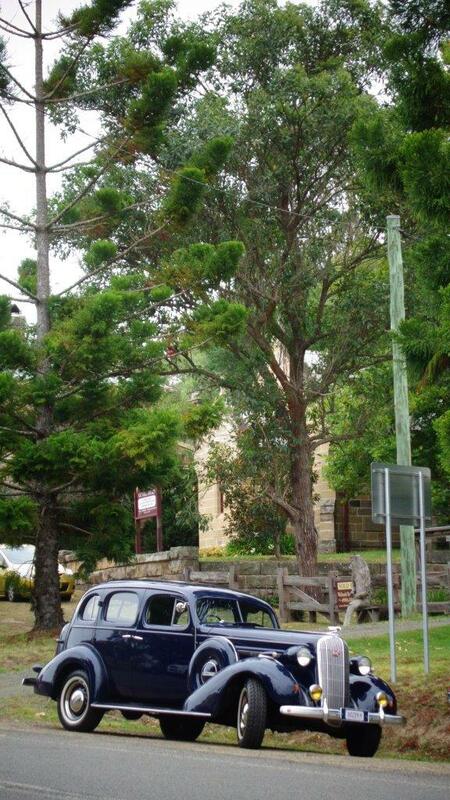 The road was originally built by convict labour between 1826 and 1836 to connect Sydney with Newcastle and the Hunter Valley. 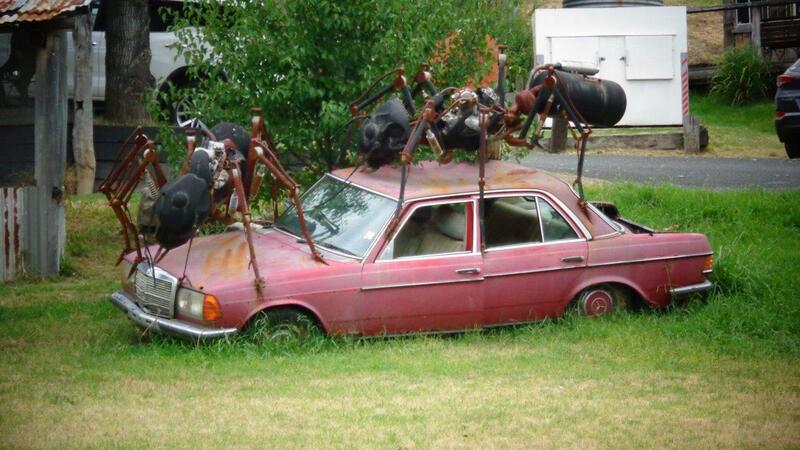 At the town of Laguna I found a small farmer’s market and on an adjacent grassy bank I notice this unfortunate Mercedes Benz under attack by several enormous ants! Look out Klaus they are coming for your Benz! I thought it best NOT to drink the local water and so continued on! There seems to have been some recent roadworks completed on some of the scarier bends and hills. One significant section is located on a steep and narrow decline just south of Wollombi suitably called “Lemmings Way”! 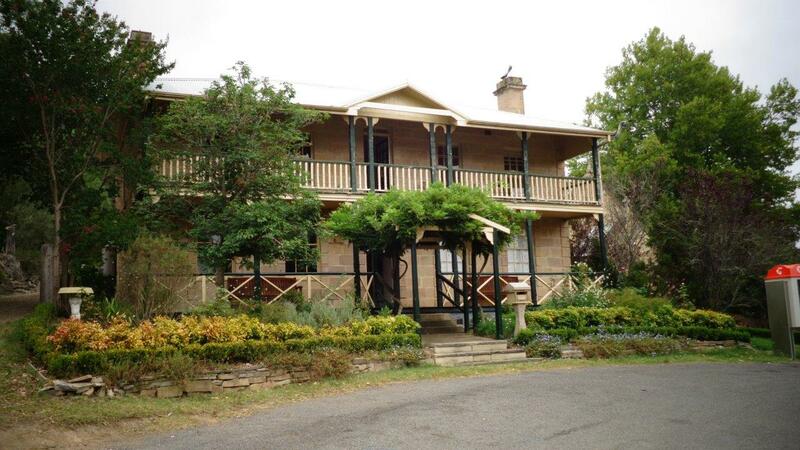 since the 1840’s but was burnt down in a fire in 1959. I had planned to have lunch there sitting in the shade of the veranda but one look at the line to the cashier found me looking for other options. 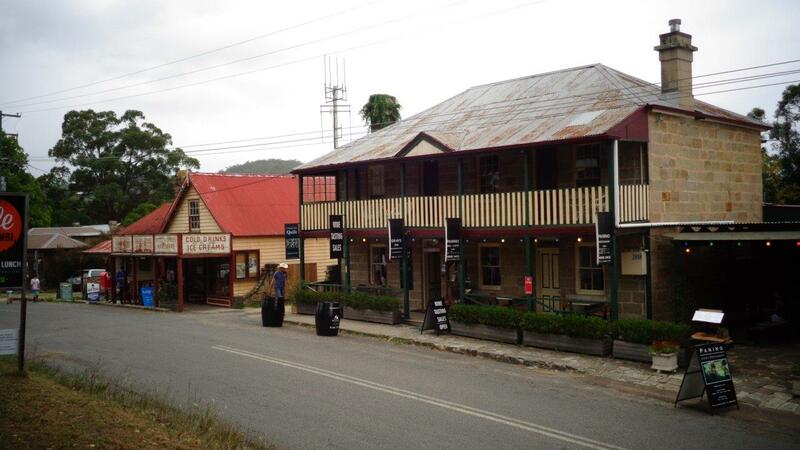 Heading off to find other less crowded locations for a bite to eat I found a museum in the old Court House, a gallery displaying Aboriginal Art, a General Store that takes you back to the late 1800’s as well as a cellar door for wine tastings and a nice little restaurant next door. 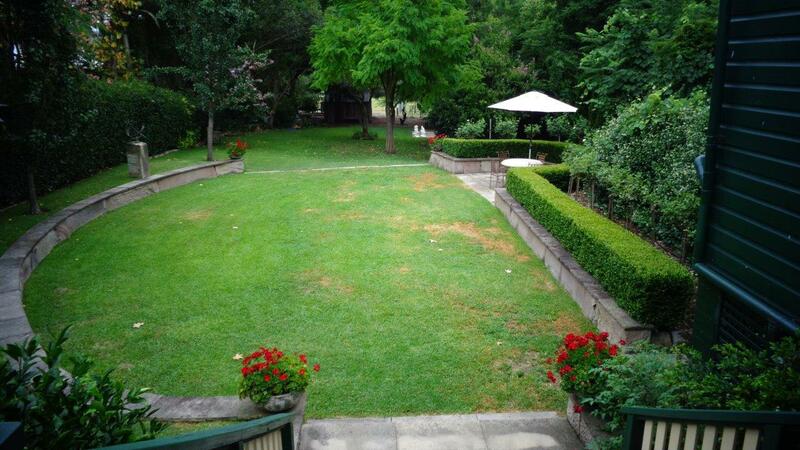 At the rear of the restaurant there is a beautiful garden for the use of patrons that I did not expect to find. A few extra tables and it would make for a fantastic lunch stop for a bunch of car enthusiasts. I decided to return home the same way I had come as I had driven passed some beautiful locations that I thought would make a great back drop for a photo of the Buick. It would be an interesting and an easy thing to start a trip from Asquith up on the old Pacific Highway via Brooklyn and Central Mangrove then link up with the trip I have just recounted and continue on from Wollombi towards Cessnock, Singleton or Maitland and probably more interestingly the former paddle-steamer port at Morpeth on the Hunter river. 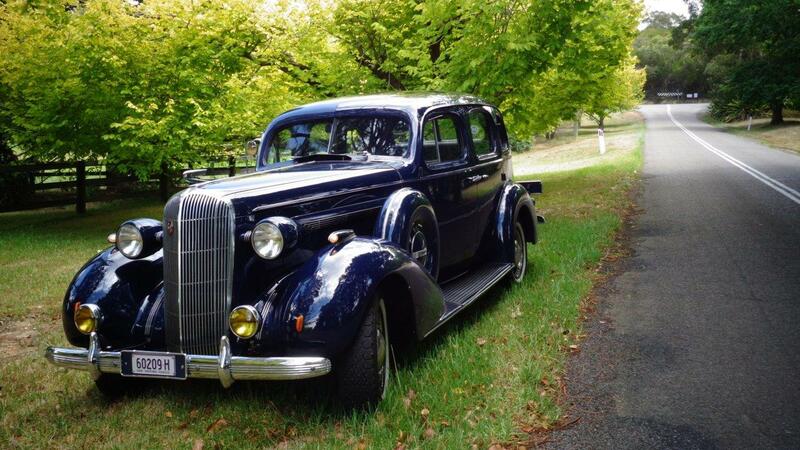 Morpeth is a lovely town…but that will be another Buick Adventure.